Smaller family-run hotel with traditional kitchen. All rooms equipped with PS/WC and TV, pleasant outdoor terrace. Our motto: Arrive – feel at home – enjoy your holiday. Hospitality has a tradition with us! Since 1987, the Zehnthof, a wonderful Hotel at the Moselle River, has been run by the Friedmann Family. For many years, a lot of work has been done to improve our wooden-framed hotel in hopes that it reaches its fullest potential. It welcomes you to 24 modern, generously equipped rooms. Many offer a balcony with scenic views of the Moselle River, Reichsburg Castle or the Cochem vineyards. In our traditional cafe Zum Brunnen, we offer a daily breakfast buffet, including a glass of sparkling wine, until 1200. Local Moselle wines can also be enjoyed at our bar in the evenings. The surrounding valley is ideal for hiking and cycling. The Vogel and Bell families welcome you to the third generation family-run Schloß-Hotel Petry. Our castle is packed full of options to choose from as you wish. Visit our restaurants, spend some days relaxing, celebrate nforgettable parties, or hold stylish events. Choose how you want to feel: stately, modern and elegant in the 35-sq-m Kohlbecher comfort room, or familiar and cost in the rooms in the main building, castle or guesthouse. Sleep like a prince. You’ll find a place for your personal wishes in a fairytale setting between vineyards, the mellifluent Moselle and the romantic castles and enchanting hiking tracks. Enjoy the creative refreshments in our wine tavern with specialities from our exclusive kitchen. An “oasis for gourmets” – our Schloß-Stube gourmet restaurant, where master chef Oliver Bell and his team surprise you with innovative, modern cuisine and interesting compositions. Sought-after drops from our wine cellar underline the signature of the exquisite cuisine. A tranquil, cosily appointed property with a central location, overlooking the Reichsburg and the Moselle. Modern guestrooms with shower/WC, TV, radio, hairdryer, seats, sometimes balcony or castle view. Comprehensive breakfast, guest refrigerator. Garage for motorbikes and bicycles. Gardens. Short-stay holidays possible. The Ferienweingut Klaus Thiesen provides cosy guest rooms and holiday apartments in quiet location directly at the riverside of the Moselle. The romantic vine town Ellenz is located in the heart of the "Cochemer Moselkrampen". En-joy the picturesque view to the Moselle with dam, forest and vineyards. Well developed hiking and bicycle trails through vineyards and forests with wonderful pano-ramic views invite to extended excursions. Something very special - registered landmark cottage converted in a lovely home with personal flair for 7 (or even 8) people. In the historic centre of a little village but very quiet location. 3 bedrooms, open fire place, little garden with chairs, table and outdoors charcoal grill. Lovely surroundings. Ideal for hikers, bikers etc. and for kids with a lot of open space, water, playground. Price reduction for longer stay! Our hotel Weinhaus Fuhrmann is directly on the Moselle and blessed by the sun. You will like the wonderful view of the river from our large terrace or balcony. Enjoy the many opportunities around the wine town of Ellenz, activated or set off by many excursions along the Moselle from Ellenz to Koblenz, Cochem, Traben-Trarbach, Bernkastel-Kues and Trier. The Eifel and Hunsrück offer many points of interest and plenty of opportunities for the best hikes in unique nature. The Nürburgring is only 45 km away and is easily accessible. Even Luxembourg, with its lovely old town, is a good place for a day trip. Apartment Sonnenschein is a spacious, bright and quiet self-catering flat with castle views. It has a double bedroom and sofa bed in the living room. Garden seating and parking are available. 15 minutes walk from the town centre. The Moselle promenade, a supermarket and bakery are 100m away. Welcome to the wine hotel. Our family, now in its 4th generation, looks after our guests’ wellbeing, and the property awaits visitors with its homely atmosphere, modern comfort and upscale cuisine. This is one of the oldest historical wine taverns in Germany. Beautifully equipped hotel rooms, some furnished in historical style. Cosy wine tavern where you can enjoy our specialities. Apartment house Bleser The 58qm large apartment (for 2 - 4 people) is located in our private residence, a few meters from the Pension Hendriks away, and in the same privileged location, 5 minutes walk to the city center and Moselle promenade. Domestic equipments: Separate entrance with spacious hallway, fully equipped kitchenette with dishwasher and microwave. In the kitchen is a furnished dining area with 4 chairs. Cozy living room, equipped with a flat screen cable TV, radio / CD and DVD player. Here is a living / sleeping couch, which is extendable to the double bed. Separate double bedroom, separate bath / WC with hair dryer. Covered patio overlooking the garden. In the garden is a sunny patio. Our Hotel Our Hotel ... is beautifully situated overlooking the Moselle weir and lock. It has been in family hands for generations and is still run by the family with all the advantages of a family business. We are specialised in catering for clubs and for group travel and offer our guests modern guest rooms, entertainment and typical Moselle cuisine. Qualified guides who know the local area well are also part of our extensive programme. Our hotel has a lot to offer families, individual travellers and motor cycle enthusiasts. Look forward to a relaxing but exciting holiday at the Moselle. Welcome to our Moselstern hotel “Zum guten Onkel”. We are committed to serve our guests to the very best, which has been our tradition since 1890. Our hotel is characterised by its Moselle rustic style. The establishment of our guest rooms as well as offerings from our kitchen reflect this. Whether you plan to go hiking, biking, or are bikers, our hotel “Zum guten Onkel” is the ideal starting point for trips along the Moselle, in the Hunsrück and Eifel. Your "pamper hotel" in the moselle-area If you are looking for a little hotel with personal service, friendly staff and special offers - Moselromantik Hotel THUL will give you all, you are looking for. A comfortable, charming, little hotel in Cochem/Moselle, beautifully situated, overlooking the River Moselle and the old town of Cochem; directly near the vineyards, the wood and the nicest footpath from Cochem with nice view points. Nearest hotel to the leisure centre from Cochem. Our hotel is situated at the bank of the mosel. You’ve got a wonderful view of the mosel, its storage-lake, the forests and the vineyards. We are glad to be able to spoil you in our tastefully furnished and modern rooms. The idyllic and wine resort of Bruttig-Fankel, with its old half-timbered houses, narrow streets and picturesque corners located on the right bank of the Moselle of the most romantic part of the Mosel, the "Cochemer staples", 8 km upstream from the town of Cochem with your castle and 2 km downstream from Beilstein, the Sleeping Beauty of the Moselle. Bruttig-Fankel and its scenic surroundings offer many opportunities for a relaxing stay. The vacation apartment is situated on the sunny side of Cochem in a quiet though central location and comes with a huge terrace with seating and sunbeds and provides a great panorama view upon the city, Mosel and Reichsburg, only a few steps away from the historic old town. All main sights are within easy reach. You can experience a fantastic scenery while going on a boat trip on the river Mosel, be it during the day or at night with dance and music, while the city and castle lights reflect in the water. Englisch Our hotel Moselkern is located in the idyllic wine village Moselkern right next to the Mosel promenade, opposite the Druid Stone. It consists of 23 double rooms and 2 single rooms, all with balcony, that are lovingly decorated and equipped with a shower/WC/TV. Depending on the location of your room, you will have an unrestricted view of the river Mosel and the vineyards. We look forward to welcoming you as our guests. Villa Tusculana is situated on a hill overlooking part of the Moselle river and the town with its castle. Behind the house you have a completely fenced garden. The terrace next to the house is equipped with a table and chairs, also two deckchairs and a bench. Inside the house you find altogether 3 double bedrooms and one single bedroom for 7 persons. On the first floor you find two double bedrooms and the single bedroom. The rooms are designed in different styles: Roman style, African style, Romantic style. The Bathroom in the 1st floor has a bathing tub, shower and toilet. There is a supply of beddings and towels as well as a bathrobe for every guest. On the ground floor you find a fully equipped kitchen including a dish-washer, oven, electric stove, coffee maker, electric kettle, toaster, egg boiler and microwave oven. Smaller groups can enjoy their breakfast in the kitchen: there is a table with four chairs. For huger groups we recommend the dining-room with its big table and room for 7-8 people. The dining-room is - like the living room opposite to it partly equipped with colonial style furniture and antiques. In the living room there is a TV and a stereo system. There are also two sofas and three armchairs. Cable-TV and WiFi are free. A little balcony in front of the living room offers a nice view over the River Moselle. The basement has another double bedroom and a modern bathroom including shower, toilet and whirlpool. Next to the bathroom you find a washing machine and a drier, an iron and an ironing board. Enjoy the unique view from our magnificent terrace far away from noise and hectic everyday life. You’ll stay in a neat, clean room, some of which have views of the Moselle and/or a balcony. Villa Vinum is a boutique hotel located in the town of Cochem on the river Moselle. The historical building was restored to its current glory in 2011. A small fountain and a fireplace in the hallway will welcome you in giving you an idea in what to expect from the rest of the house. The same relaxed atmosphere continues in our lounge and library room. The huge oak wood staircase will lead you to our twelve luxury guest rooms. A delicious breakfast is served in our two wonderful breakfast rooms, which are connected to a large terrace in a gorgeous setting in front of the vineyards of Cochem. After a day of touring and sightseeing please feel free to relax in the warm ambience of our house, enjoy the sun on the terrace or just take it easy. We can make reservations for a massage or spa treatment for you, or even book an appointment with our favourite hairdresser. Just feel free to ask! We will, of course, give you the best tips for our favourite restaurants, tours and things to do in the region. The hotel is situated in a quiet area but also centrally lacated in the village of Klotten -54 beds in comfortable rooms are available -rooms are including shower, toilet, hair dryer, radio -the house is ideal for group travel and for individually journeys -breakfast is offered as a comprehensive breakfast-bufet -tradition, informal managment and a stylish ambience are values fostered by us - it offers different rooms for every kind of celebration an conferences. -Car-park for the cars. bikes and motor-bikes can be parked in a garage. Located just a few minutes’ walk from the Cochem city centre, our peaceful pension is the ideal place for relaxation and recovery. Whether it be as the starting point for long walks, bike rides or excursions to the numerous attractions of the region, we are happy to help and advise you. When visiting the nearby recreation centre or going for a walk through the Conder Forest or vineyards, with a unique view over the Moselle Valley and all of Cochem, you can leave your car at our property’s parking bays. Our establishment has been newly renovated and offers you cosy rooms (also suitable for small families), as well as numerous outdoor areas on our many terraces and open-air seating areas in the garden. Your day at our property begins with a comprehensive breakfast. Feel personally cared for and enjoy a stressfree stay. Vineyard in calm situation, cultivation of white and red wine, cosy guest rooms with shower, WC and TV, loange with refrigerator, balcony, parking lot, winetastings. 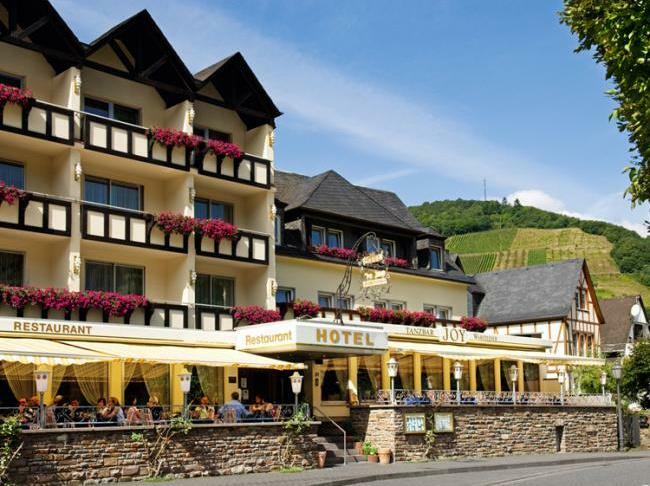 This family-run, 3-star hotel is located in Cochem on the banks of the Moselle river. It offers comfortable rooms, a fee breakfast buffet and a restaurant serving regional food. All of the rooms include a modern bathroom, cable-Tv channels and a minibar. The Hotel Noss's large breakfast buffet is included in the room rate. The hotel restaurant offers views of the Moselle, and serves local cuisine and fine wines. Free Wi-Fi is a available in all public areas of the Hotel. Lots of well-signposted hiking and cycling trails can be found close by. Enjoy a holiday on the winegrower's estate in the typical Moselland dry stone house with a large vault, visit to the cellars and wine tasting, country-style holiday apartment and modern rooms. In one of the most elegant sections of the Moselle,we offer you a unique experience in holidaying& wine. In 2009, our service was awardedwith the Moselle umbrella brand’s qualitycertificate.The guestrooms and holiday apartments invite you to take a holiday, and provide a lot of space for relaxation and rejuvenation. In our wine gallery with café and vinotheque, you can enjoy the moment with culinary delights from the region. We also offer special packages, small groups hikes and special adventure weekends. Enjoy some time-out from everyday life. With decades of experience as hosts, we attend to the wellbeing of our guests. We nurture the tradition of the former (Karden) canons, and welcome you to our stylish property! Experience the spectacular Moselle landscape, and let us indulge you! Hikers and cyclists are very welcome! Please check our changing package offers! We will be happy to arrange a wine tasting/distillery tour for you (directly opposite). From our domicile, which is located in a prime location with panoramic views of the old town, Mosel vineyards and the Reichsburg, it is only a few minutes walk to the old town and the banks of the Moselle. You live centrally but quiet. Enjoy your best holidays with all amenities in our lovingly furnished home. Relax on the balcony with an indescribable view of the Moselle landscape, Cochem Castle and the Pinner Cross. A second large terrace offers a view of the countryside. A nice day with countless impressions of the city and the original wine landscape, you can relax in the living room on a comfortable sitting area with a novel or a good movie (flat screen TV). Wi-Fi is free with us. Or you can enjoy the fantastic view of the illuminated castle Cochem from the balcony. A bathroom with a hairdryer and a well-equipped kitchen in the bedroom, comfortable beds and a CD player are provided. double room situated in a listed timbered house near the Moselle river, seat in our spacious garden. Parking place, shelter for bikes. Ideal starting point for activity holiday and sight-seeing in the Moselle, Romantic Rhine and Eifel region. Located directly in Beilstein on the Moselle. Beilstein is one of the most beautiful places of the Moselle. They expect at our hotel six comfortable double rooms with stunning views of the Moselle. With attention to detail, all within the comfort of the Moselle with the lift. Stay in a central location away from the hustle and bustle just 5 minutes walk from the city center in our personally managed guesthouse. We offer comfortable non-smoking guest rooms with shower / WC and cable TV. A rich breakfast buffet awaits you in the morning from 8:00 to 10:00. A cozy lounge with drinks and house wines as well as a sun terrace invite you to linger. For self-catering 2 modern apartments are available. WELCOME to our hotel in Cochem/Sehl with its fantastic view at the Reichsburg. You can reach the pedestrian zone by walking within 15 minutes or by car within 2 minutes. Our restaurant is well known beyond the borders of Cochem and open all-season. On summerdays it´s nice to relax in our beer garden with its wonderful view at the Reichsburg, enjoying the delicious dishes of our restaurant. We hope you´ll have a nice abidance. Hotel Holl is a family-run business located in the charming town of Cochem on the Mosel river. Visit one of the most beautiful sights of the city, the Reichsburg Cochem, or relax with a leisurely walk right on the Moselle. Hotel Holl offers you the choice between single, double, triple, quad room and twins.All rooms are equipped with there own bathroom, a hairdryer, a cosmetic mirror and cosmetic products, as well as a flat-screen TV. In addition to the standard categories, the Hotel Holl offers an upgrade to the comfortable rooms, which are additionally equipped with a balcony or terrace and / or walk-in shower with rain shower.The Comfort double rooms at the Hotel Holl's guest rooms feature luxurious box Bonnel spring-core beds with French toppers, French balconies, USB charging sockets for charging or using multiple appliances at the same time, and electric shutters The room price includes the rich breakfast buffet with its fresh regional products. Enjoy your first cup of freshly brewed coffee in the new, elegant ambience, on the decorative rock wall from the Moselle Mountains in the new breakfast restaurant in the Hotel Holl. After a hearty breakfast at Hotel Holl, you can visit the center with its tourist attractions, shops and wine terraces. Admire the Reichsburg Cochem with the great panoramic view of the Moselle, the green forests and the vineyards. A wine tasting should definitely be a part of your holiday at the Mosel. Take a boat on the Moselle to Beilstein, enjoy delicious, regional specialties wines in the numerous restaurants right on the Moselleriver. In the evening you can enjoy a lively, bright nightlife with music and dance in Cochem on the Moselle. At any time and after an powerful day in Cochem, the Hotel Holl offers you lot of snacks and drinks for self-service at the vending mashine PetsPets are allowed in the Hotel Holl on request and at a charge, please mention the pet in the room reservation, otherwise the room can not be guaranteed. ParkingThe parking of motorbikes and bicycles in the video-monitored hotel garage is possible on request and for a fee. Please mention the room reservation.Garage for up to 40 motorbikes. For cars, Hotel Holl offers its own parking spaces (reservation required). Parking is free of charge in the public parking area in the immediate vicinity of the hotel. The public, paid parking is round about 200 meters from the hotel away. We have opened our establishment on the 1st of March 1999. We are based within a short distance to the historic Castle of Cochem, surrounded by a Lovely peaceful, yet still lively location in the centre of Cochem Town. All of our rooms have been created with love to detail and include showers, toilets, hair dryers as well as radio and television facilities. All of our guests are welcome to relax in our beautiful garden which provides a panoramic view over the historic Town of Cochem. Parking spaces are annexed to our hotel property and are provided for the guest, we are also able to offer private garages if requested. We are proud to be a listed and recommended Holiday Inn by the ADFC, Allgemeiner Deutscher Fahrrad Club (General German Cycling Club). Warm hospitality at the wine-growing estate at the edge of the vineyards. Rest and relaxation in the large garden with outdoor pool. Bread roll service/winegrowers' breakfast available. Impressive wine experience tours. Our sun-drenched (if it seems!) holiday home was built in the 1930s. We have completely renovated and refurbished it for you. Equipment: All rooms, also the baths and the guest toilet have at least one window. The living and bedrooms, the kitchen and the bathrooms are equipped with oiled wood floors and some with high quality carpets.The house is fully equipped with cutlery, crockery, dishwasher, towels, bedding, washing machine and dryer etc.In the living room you will find a stereo with iPod connection, CD player and radio, as well as a DVD player and a TV with satellite channels.Our house can easily be occupied even by a few people and offers a perfect retreat for those who enjoy it’s cosiness, but do not want to miss the proximity of restaurants and urban flair. The Hotel Karl Müller is situated directly on the promenade of the river Moselle in Cochem's Old Town. From here everything can be reached easily by foot. Marvel at the wonderful view of the romantic Old Town and the Reichsburg Cochem castle. Go for a stroll through the nooks and crannies of the small romantic alleyways between historic timber-framed buildings and experience the charm of this famous town of the Moselle region, whose history spans 2000 years. Welcome to the Cochemer Jung! The special thing about the hotel Cochemer Jung is the idea of sustainability. Being the first zero-emission-hotel in Rhineland Palatinate, we want to make our contribution to environmental protection and in this guaranteeing the future of our beautiful Mosel region. Enjoy all the comfort of a first-class hotel in the center of Cochem, since zero-emission does not mean that you have to do without the amenities of a 3 star superior hotel. We would like to bring our guests closer to the Mosel region in a very special way. The Keßler-Meyer family and your affectionate hosts welcome you! Mosel.Bewusst.Erleben. Look forward to your next Moselle vacation at Pollmanns hotel. Comfortably furnished rooms, a renowned kitchen and the best wine that the cellars of the Ernster winegrowers have to offer are the ideal way to enjoy a relaxing holiday. Variety is provided for you. Enjoy a splendid glass of wine on our large Moselle terrace, in the courtyard or in the “old cross vault cellar”. Relish the tasty dishes in one of the restaurants in the “Wintergarten“, “Kaminstube“, “Wohnzimmer“ or the “Spiegelsaal“. We cater for your active vacation with Nordic walking, bicycle and canoe rental and well signposted hiking trails. Active all-inclusive programs “Schlemmen und Erleben“ (indulge and experience) and “Kanuerlebnistage im Moseltal“ (canoe adventure in the Moselle valley). We also invite you to visit our new 450 square metre wellness area “Pollmanns-Moselonne“. Allow your body and mind to rest. We offer special “getting acquainted” and “spoil yourself days”, incl. applications with 2, 4 or 7 overnight-stays for a relaxing holiday. If you're looking for comfortable and tastefully decorated holiday apartments in a classy ambience, then you are right with us. In Winneburger Hof, history and modernity combine in a successful symbiosis. As a family business with eight holiday flats and two apartments in Ernst near Cochem on the River Moselle, your well-being is our personal concern. Our guest house and all apartments are not only a perfect starting point for your active holiday, but also a harmonious spot for a break and to relax in the wine and holiday village Ernst. The central yet quiet location offers you the best balance for your vacation. Just 50m (150ft) away from the Moselle with its wide meadows you can also soothe your soul directly on the river. Our vinotheque with wine refrigerator is stocked with best wines of outstanding wineries from Ernst. The wine lounge in the old house core from the 16th century was lovingly prepared in 2013 and invites you to enjoy a few glasses of wine. All our guests receive the „Gästeticket“ (guest ticket) with which they can use all buses and trains in the Cochem-Zell district (and since 2017 even further!) for free. The capital town Cochem is located at a distance of 5km (3 miles) in the immediate vicinity. Two holiday-flats for 2-5 persons on our vine-farm at the end of the village. Lovely garden with a 9x4 m swimming-pool, heated by solar. In the yard carpark and parking-place for bikes. Free WIFI. Children under 4 years stay for free. Flat “Calmont”: 45 qm, for 2-3 persons. Living room with kitchen, bathroom, balustrade, bedroom, balcony. Flat “Auslese”: 52 qm, for 2-4 persons. Living room with kitchen, 2 separate bedrooms, bathroom, balcony. The wine-village Bremm with its famous river-bend is situated at the bottom of the Calmont, the steepest vineyard of Europe, between Cochem and Zell. In our region you find: - Walking-trail through the Calmont, Europe´s steepest vineyard with lots of beautiful views. - A lot of different walking trails. - Bicycle-trails along the Mosel. - Ideal situated for trips to Trier, Koblenz and Luxemburg. - More destinations you find in the info-map in your flat. Run by the Konzen family, now in its 5th generation, since 1864. Typical regional meals prepared by the chef are served in the restaurant and on the sun terrace right on the banks of the Moselle. Your smile and your satisfaction are the incentive to give our best each day to make you an unforgettable stay at the Moselle. Experience hospitality in a unique and hearty atmosphere. We would like to get you into this incomparable natural and cultural landscape with its different facets and colors. Leave everyday life behind you and let us sooth your soul! Ready-furnished 35 qm ground floor holiday flat, calm central location with outdoor sitting area and a room for bikes. Supermarket and leisure facilities can be reached in a few walking minutes. Our house in the middle of the heart of treis-karden. You sleep also in quit rooms to the inside of the winefarm. So you sleep very quit. The rooms and the appartements are all new and modern. You can make walking- or bicileystrips round treis-karden. Our vacation home is situated in an beautiful and calm natural surrounding apart from the transit traffic. You can reach the city of Cochem in about 5 minutes by car. The forest-rich environment invites to long walks on the numerous round moving ways. Holiday apartment for 2 persons situated in a listed timbered house near the Moselle river, seat in our spacious garden. Parking place, shelter for bikes. Ideal starting point for activity holiday and sight-seeing in the Moselle, Romantic Rhine and Eifel region. Quiet location in the middle of the forest, with adequate parking. Specialities restaurant, terrace hotel bar and hearth room. All rooms are accessible by lift, and have a shower, WC, hairdryer, telephone, minibar and colour TV. Apartments in one of the most beautiful villages in the Mosel Valley, in Ediger. Apartments in all sizes. The apartments are in an 260year old manor in the middle of the historic center of Ediger. A Vinery and a WineCafe/Restaurant and also a Destillery rounds up the offer of the Springiersbacher Hof.